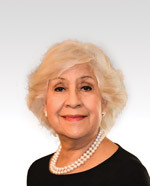 Margarita Calderón, a native of Juárez, Mexico, is Professor Emerita and Senior Research Scientist at Johns Hopkins University’s Graduate School of Education. She is President/CEO of Margarita Calderón & Associates, Inc.
Margarita has served on several national panels, among others: the National Research Council’s Committee on Teacher Preparation; the U. S. Department of Education Institute for Education Sciences’ National Literacy Panel for Language Minority Children and Youth; the Carnegie Adolescent English Language Learners Literacy Panel; and the California Pre-School Biliteracy Panel. She was principal investigator in three five-year studies on Expediting Reading Comprehension for English Language Learners (ExC-ELLTM) Programs, one that focuses on professional development of science, social studies, and language arts teachers in New York City’s middle and high schools, funded by the Carnegie Corporation of New York; and two other studies, the Bilingual Cooperative Reading and Composition (BCIRC) in El Paso, Texas, and another funded by the U. S. Department of Education in the Pacific Islands for fourth- and fifth-grade teachers and students, and in middle and high schools in Alaska. She was co-principal investigator with Robert Slavin on the five-year national randomized evaluation of English immersion, transitional, and two-way bilingual programs, funded by the Institute for Education Sciences. She has published over 100 articles, chapters, books, and teacher training manuals and is invited to present at national and international conferences and professional development events.